Maybe old news, but wtf!? The flag of Nationalist China......wtf?!? They import that from HoI? I've actually seen a Russian flag in game, was at a forward base a little ways away from a town. Don't remember which one it was though. i'm digging the hello kitty calender in the background there bro. Gettin ready for a sleepover? should I bring smores? rp loooves smores with his coffee. Believe it or not, I had this explained to me a while ago, when I first came into game. 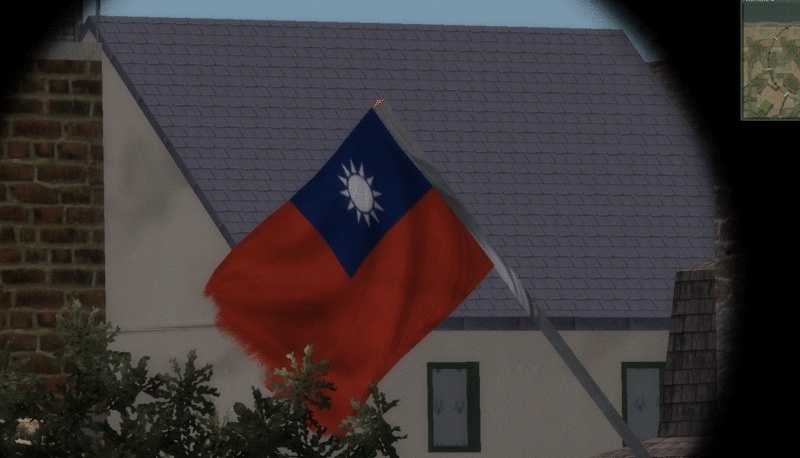 Its a China flag, cause back in the day, when CRS staff was working for a different firm, they were either told move to another country where the game was going to be based out of (I think it was Australia) or be forced to quit. And something about how they wouldn't be even able to get thier own positions in the new country, so they were rats on a sinking ship, and thier backs up into a corner...i.e. CRS. As for the China flag, see...who they worked for moved to Aussie land, and it failed, so a company and China bought the old company out. This is there homage to the company that got bought out. IF i'm wrong about this, i'm sorry, since this is what I was told.